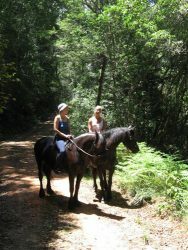 Black Horse Trails - Spectacular Horse riding trails through the indigenous forest in the new Garden Route National Park. Occasional sightings of the abundant wildlife in the area and home to the elusive Knysna Elephant that have been spotted in this area. The rides are structured to suit everyone and the trails are safe. The horses are well trained and allow you to explore these majestic forests on horseback - giving you the freedom to fully enjoy and appreciate natures treasures. The trails are all supervised by very experienced guides. We speak English, German and Russian. 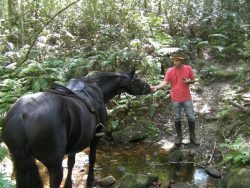 Our farm is situated above the Wilderness and at the foot of the majestic Outeniqua Mountains.Our rides venture under the canopy’s of Blue gums, between the endless rows of pines and into the cool damp of the mystical indigenous forests in the Wilderness national parks where the bird and animal life is abundant. The Knysna lourie, many species of raptors, monkeys, baboons and bush buck are commonly sighted on our trails along with the more elusive bush pigs and snakes who occasionally surprise us with a flash appearance.We can take groups of up to seven people if one in the group is experienced, or six beginners.We try to keep our groups small and intimate and match groups with an equal amount of riding experience as to lessen the pressure for those to go at a pace one might not be comfortable with, whether too fast or too slow. We don’t mind taking out lone cowboys or cowgirls so feel free to book even if it is just you. 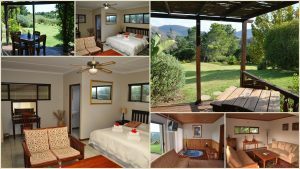 For Accommodation 14 Km from Black Horse Trails, have a look at our accommodation options by following the link below. To make a reservation follow the Book Now link.